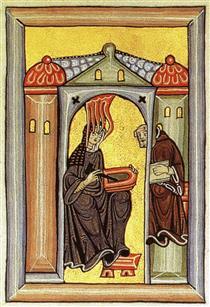 The best-known religious woman of the twelfth century was Hildegard of Bingen (1098-1179). She joined the double monastery of Disibodenberg in the Rhineland as a child and became the abbess of its community of nuns. 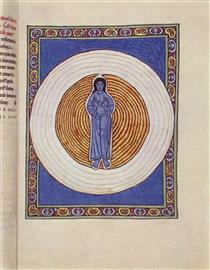 In 1147 she experienced a vision that caused her to leave Disibodenberg and set up her own community, solely of nuns, at Rupertsberg near Bingen in the Rhineland.Hildegard was a cultured woman of wide learning: she composed music, was a prodigious letter-writer and wrote texts on medicine and herbalism. However, she was best known in her time for her visions, which were set down in writing and illustrated by the nuns of her community. 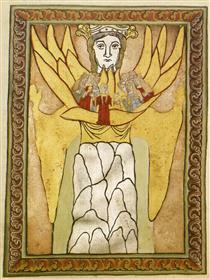 The two books of Hildegard's visions are entitled 'Know the Ways of God' (lost since 1945) and 'The Book of Divine Works'. 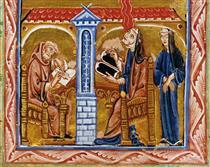 Hildegard was born around the year 1098, although the exact date is uncertain. Her parents were Mechtild of Merxheim-Nahet and Hildebert of Bermersheim, a family of the free lower nobility in the service of the Count Meginhard of Sponheim. Sickly from birth, Hildegard is traditionally considered their youngest and tenth child, although there are records of seven older siblings. 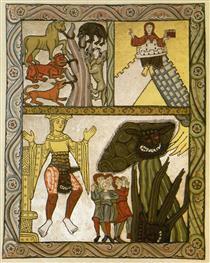 In her Vita, Hildegard states that from a very young age she had experienced visions. Second vision. 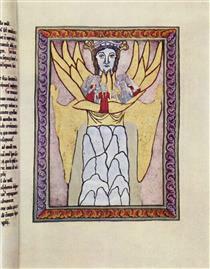 Adam as Mankind Hildegard of Bingen ? 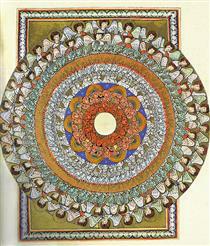 Vision of Divine Love Hildegard of Bingen ? 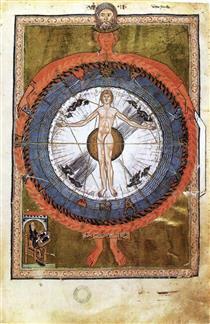 The Cycle of the Seasons Hildegard of Bingen ? 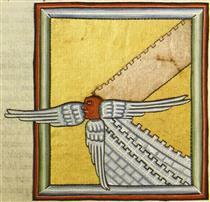 The Orders of the Church Hildegard of Bingen ? 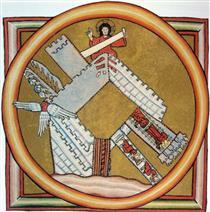 Vision of the Last Days Hildegard of Bingen ? First Vision. 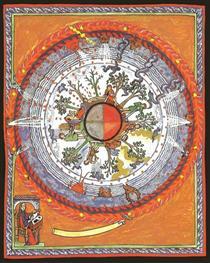 Fiery life-force Hildegard of Bingen ? Ninth Vision. 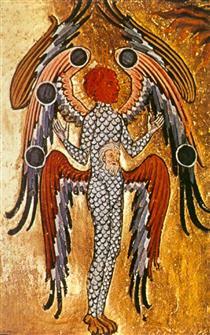 Personification of God's power Hildegard of Bingen ? 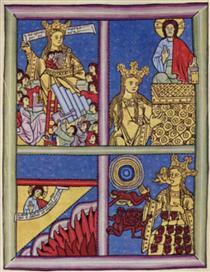 Frontispiece of Scivias, showing Hildegard receiving a vision, dictating to Volmar, and sketching on a wax tablet Hildegard of Bingen ? 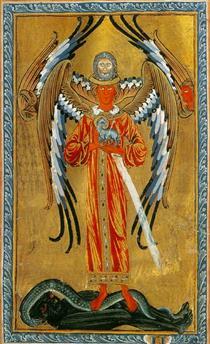 Vision of the angelic hierarchy Hildegard of Bingen ? 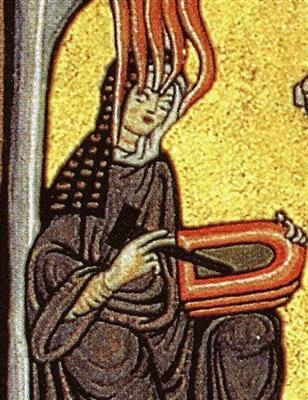 Fifth vision Hildegard of Bingen ? 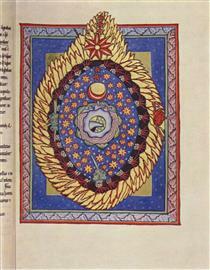 Six days of creation Hildegard of Bingen ? 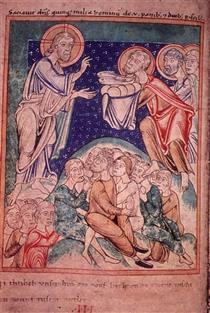 The Zeal or Jealousy of God Hildegard of Bingen ? 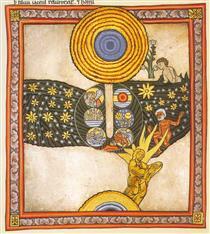 Vision of the City of God Hildegard of Bingen ?